In 1994, Ron Howard was one movie away from director purgatory. No, you say, surely not the Oscar winning director of "A Beautiful Mind" and the man in charge of the sure-to-make-jillions "The Da Vinci Code." Why, he's a national treasure! He's a national treasure now. In 1994, he was the man who followed "Parenthood" and "Backdraft" with the ill-conceived Cruise/Kidman movie "Far and Away" and the god-awful "The Paper." One more "Paper," and he, not Rob Reiner, is directing "Alex and Emma." But he didn't make another "Paper," at least not right away. (He waited five years, and called it "EdTV.") Instead, he made the spellbinding "Apollo 13," based on the harrowing story of three moon-bound astronauts who, with the help of their tireless crew, miraculously brought their damaged ship back to Earth. It's a thriller, a human-interest story and technical marvel all at once, a rare feat if ever there was one. Set over six harrowing days in April 1970 that the Beatles decided to break up the day before the launch was the first sign of trouble the story centers around Jim Lovell (Tom Hanks) and his crew, Fred Haise (Bill Paxton) and Ken Mattingly (Gary Sinise). Lovell has the unfortunate task of telling Mattingly that he can't make the flight; he's been exposed to the measles and hasn't yet had them, so rookie Jack Swigert (Kevin Bacon) gets the nod. Mattingly was spared. Halfway to the moon, the oxygen tank explodes, leaving the ship severely crippled. In order to save the remaining air they have, Lovell, Haise and Swigert move into the lunar module (designed to fit two, not three) and ricochet around the moon with barely enough power to run a toaster. No problem. He wasn't nominated for an Oscar, due to the ensemble nature of the cast, but "Apollo 13" contains one of Tom Hanks' finest performances. 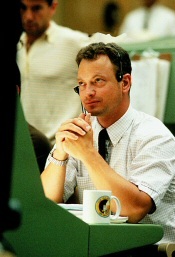 We need to believe in Lowell in order to believe any of the outrageous obstacles he and the Apollo crew encounter and overcome, and Hanks delivers. 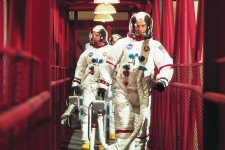 Ed Harris provides strong backup as NASA crew chief Gene Krantz, who rightfully views their ability to bring the boys back home as their finest hour. But it's Ron Howard's mother, Jean Speegle Howard, who steals the movie from all of them as Jim Lovell's mother Blanch. When Lovell's wife Marilyn (Kathleen Quinlan) worries that Jim won't come back, Blanch shows she has the same steely resolve as her son: "If they could get a washing machine to fly, my Jimmy could land it." Ron Howard may have won his Oscar for "A Beautiful Mind," but "Apollo 13" was and is his finest hour. He got the right cast (we should thank Brad Pitt and John Cusack for turning the movie down) and the right group of people to help him make something visually stunning and spiritually uplifting. A movie for the ages.